In 1998, the Attorney General’s Office reached a settlement with the major tobacco manufacturers that imposes major restrictions on the industry’s advertising and marketing machine, curtails its ability to fight anti-tobacco legislation in our political arena, and provides states quick mechanisms to enforce the agreement. In addition, it provides states approximately $206 billion through the year 2025 – including $4.5 billion for Washington State – to help rectify the harm caused by tobacco. The tobacco settlement is the largest financial recovery in legal history. 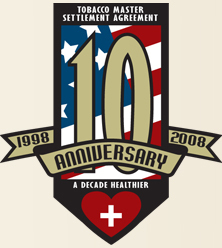 The 1998 Tobacco Master Settlement Agreement (MSA) between tobacco companies and 46 U.S. states was the largest civil litigation settlement in U.S.history. Its central purpose was to reduce smoking, and particularly youth smoking in the U.S.
Each of the 46 states gave up their legal claims that the tobacco companies had been violating state antitrust and consumer protection laws. The tobacco companies agreed to pay the states billions of dollars in yearly installments to compensate them for taxpayer money that was spent on patients and family members with tobacco-related diseases. The MSA resolved litigation brought by over 46 states in the mid-1990s against majorU.S.cigarette manufacturers: Philip Morris, R.J. Reynolds, Brown & Williamson, and Lorillard, plus the industry’s trade associations and PR firms. It settled the state lawsuits that were trying to recover billions of dollars in costs associated with treating smoking-related illnesses. The Attorneys General of the 46 states signed the MSA with the four largestU.S.tobacco companies in 1998. In 2001, the Legacy Foundation launched “truth” campaign. The American Journal of Public Health publishes peer-reviewed research that finds that the Truth campaign, funded by the MSA, is linked conclusively to 22 percent of the overall decline in youth smoking rates in 2000–2002—translating to 300,000 fewer smokers in 2002. Since the MSA was signed in November 1998, about 40 other tobacco companies have signed onto the MSA and are also bound by its terms. Under the agreement, state attorneys general are responsible for enforcing the restrictions on cigarette marketing and advertising.